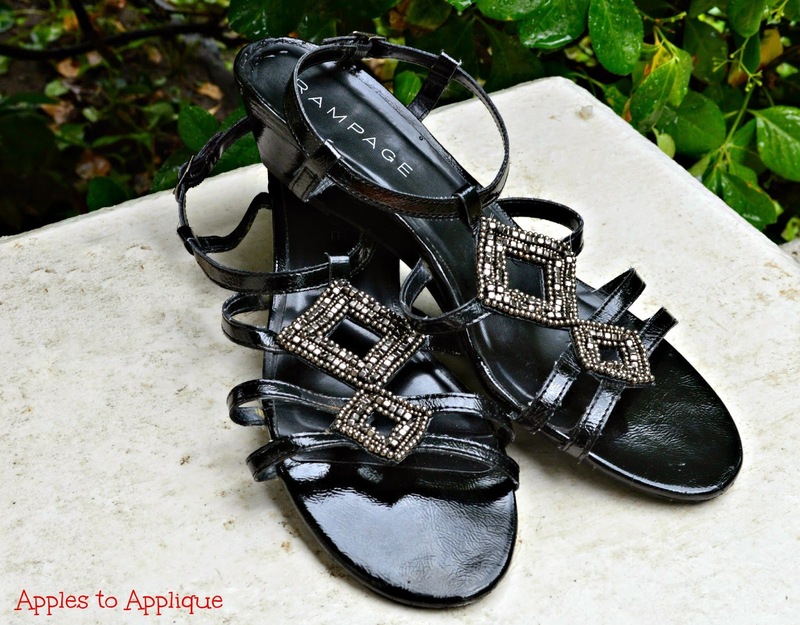 I love to wear strappy sandals all summer. They're perfect because I can wear them with jeans and a cute shirt, or with slacks and business casual attire. They look dressier than flip flops, but they're super comfy. However, I have also noticed that strappy sandals tend to get these annoying stringy things hanging off of the straps after just a few wearings. Maybe no one else notices, but when I look down at my cute shoes and see these ugly strings, I feel tacky and less put-together. It bugs me because it makes my shoes look much more worn out than they actually are. Here's a quick tip to help keep your straps looking newer for longer. First, cut off any existing hanging strings, as close to the strap as possible. Next, apply a clear sealant on just the edges of the straps. I used Mod Podge because I had it on hand and was out of clear nail polish, but I think clear nail polish would work the best. Let the Mod Podge or nail polish dry and you're good to go! The sealant should prevent, or at least slow down, the unraveling of any strings on the edge of the straps. Check back next Tuesday for another quick tidbit, or later in the week for more in-depth posts on a multitude of topics. Linking up with Treasure Box Tuesday. It's such a simple fix, and makes them look so much nicer! This is awesome, i am definitely going to do this to my old sandals! Isn't it great giving new life to old things? What a brilliant idea. I hate those darn stringy things on my sandals. I even have clear finger nail polish with me this week on vacation, I can't wait to get back to the hotel room to try this. Thanks for the idea. I hate them, too! I hope this worked out well for you! Nice work! My wife is forever dealing with this.. I hope this helps her out! Great idea! Why didn't I think of that??! Sometimes the simplest things evade us. I wish I had thought of it years ago! Thanks for sharing this. =) This will come in handy for me this spring/summer. You're welcome; glad it's useful! That is wonderful idea. I will use it next time. Thanks; I'm glad you found it helpful! Why did I never think of that?? I can't tell you how many pairs of shoes have gone in the trash over the years because they started to fray. I don't know why I just now thought of it. I've thrown away too many shoes, too. How easy was that? Thanks for the tip! Oh wow, I have never thought of doing this. This is a super easy and fun DIY trick. I don't know why I didn't think of it sooner! Such a quick fix.